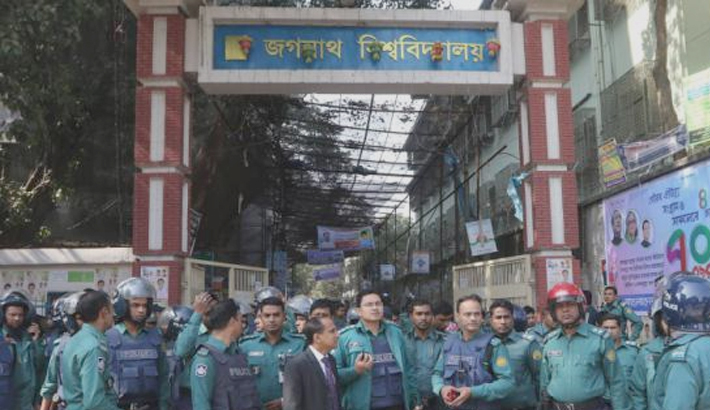 At least 15 people were injured in a series of clashes between two groups of Bangladesh Chhatra League (BCL) of Jagannath University (JnU) unit over establishing supremacy on the campus on Wednesday. Of the injured, Shohan, a student of 11th batch of Marketing Department and Swapan, a student of 12th batch of Social Work Department of the university, sustained head injuries critically. Witnesses said the clashes erupted when some followers of Md Joynul Abedin Rasel, general secretary of the university unit BCL, swooped on Swapan at around 8:00am on the campus, leaving him severely injured, following the attack on Pharmacy Department student Anik by some followers of Md Tarikul Islam, president of JnU BCL, on the campus on Tuesday. At around 9:00am, both groups began chase and counter-chase with iron rods, sticks, machetes and bricks bats and it continued till 1:00pm that left several activists of the both factions injured. “We seized four sacks of iron rods conducting drive on the campus,” he added.